When I met with Simone in Vegas he mentioned the Soho store was going to open pretty soon- then today I got sent this flyer! The brand new Tokidoki NYC SoHo capsule store will finally be open March 7th, 2009 . Simone will be there signing autographs, taking pictures, etc from 1-4 PM. Make sure to get there early I’m sure there is going to be a huge line. On Monday, I was walking around Magic helping set up when I ran into Simone the owner of Tokidoki, we talked a little bit about the show and what he was up to. The next day when the show opened Jenna & I actually got a chance to sit down with him and go over the new products and get a tour of the line. Ok.. for me this was a huge deal, I have been a fan of Tokidoki since the beginning and to actually be able to talk to Simone and have him show me the line instead of his rep was amazing! I think he is one of the only artists I have ever met that I was a little nervous around, haha. Even though we couldn’t take pictures of most of the stuff coming out we did get to snap a picture of the new skateboards some online now and some coming soon! Boston based company, Mimoco has teamed up with Tokidoki for a 2nd time to release a limited-edition Valentine’s Day Mimobot. The USB drive comes in 1GB-8GB and also comes with a black furry keychain hoodie so you can safely store your mimobot. You can purchase it online here. 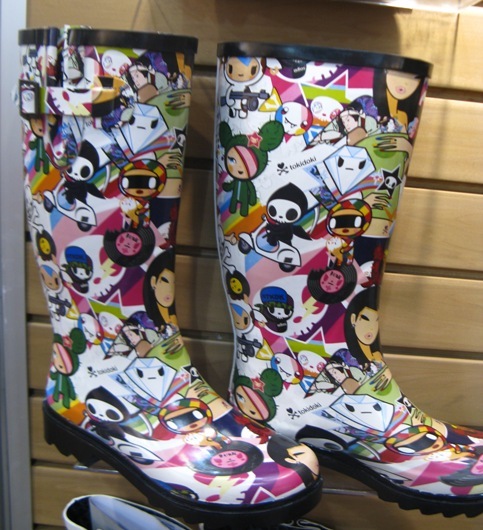 Recently spotted at WSA, these are now my new favorite rain boots. You can pick them up at Nordstrom’s starting October 1st. Even though it is still cold and rainy in Boston- summer is almost here! Here are just a couple items we recommend for summer. 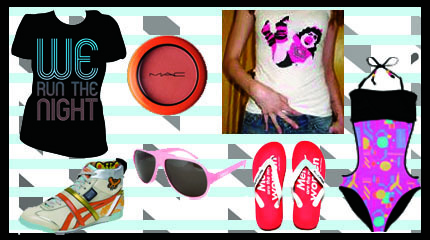 Seduce & Destroy “We Run The Night” Tee, Tokidoki X Onitsuka Tiger Sneakers, Claw Money Miss Piggy Tank, Kidrobot 80s Print Bathing Suit, MOB “Men Are The New Women” flip flops, Pink Kidrobot Sunglasses, and Mac Neo Sci-Fi Bronzer. 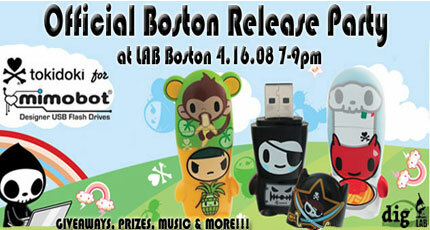 We would like to invite you to the “Official Boston Pre-Release Party” for the new Tokidoki Mimobots. Tokidoki for MIMOBOT is coming so be one of the first people to check them out!!!! Come to LAB Boston April 16th, from 7-9pm for a chance to check out the new mimobots, and also enjoy giveaways, prizes and music! Mimoco is a designer toy studio meets consumer electronics brand based in Boston, MA. With a mission to bring style and soul to personal tech devices and to inject interactivity into the underground Art Toy movement, the first fruits of our vision are the delicious and fresh mimobot Designer USB Flash Drives launched in 2005.